AccuTherm can deliver answers and products for your metal heating needs, whether it is keeping casting alloys at the proper temperature, heating sucker tubes, crucibles, metal transfer tubes, nozzles or any other type of heating applications. Here at AccuTherm, we are able to address any questions and design a heating system to meet the most demanding needs in the die casting industry. Electric heat can offer a lot of benefits for the die casting industry. It is easy to apply and can be located for spot heating, a particularly vexing heat transfer problem. Electric heat is safe to use, since it does not produce an open flame and there are no gas hoses or lines. It is easy to control and monitor. It also provides exact and accurate control with solid state temperature control and sensing probes. State-of-the-art control systems can be easily adapted to process control monitoring that is able to meet ISO quality assurance needs. 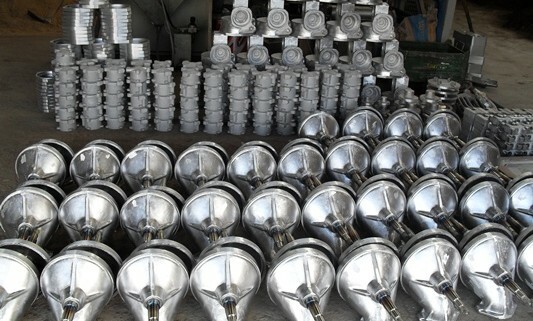 Standard stock or custom designed nozzle heaters for die casting machines. High temperature plate heaters for heating crucibles or other holding pots. Custom designed heaters for holding furnace lids. Custom designed heaters for metal transfer tubes and sucker tubes. Complete line of thermocouples and thermowells. High temperature insulated wire and associated electric hardware. Solid state temperature controls and accessories. AccuTherm’s plate heaters have incorporated the efficient and safe characteristics of the metal sheathed electric tubular element with the even heat transfer properties of a flat surface emitter. These plate heaters are designable to fit various crucible configurations in various electrical ratings and have the ability to clamp to sides of a cast iron crucible to maintain the metal’s required temperature. Standard voltage ratings 120V to 480V. Wattage ratings do not exceed 20 watts per square inch of emitter surface. Precision wound nickel/chromium resistance wire is type “A” 80% nickel and 20% chromium. Suitable for operating temperatures of 2150o F. Designed for maximum wire size, helical coil pitch, and centering in magnesium oxide matrix. Resistance wire fusion welded to alloy terminal pins providing a 360 degree circumferential weld bead. Highest grade of magnesium oxide with optimum compaction providing maximum electrical resistant properties coupled with excellent heat transfer characteristics. Above parts are encased in a stainless steel type 304 alloy tube. The tubes are impervious, preventing gas and solids from penetrating into the electrical insulation barriers. The tube is roll reduced to its finished size and annealed for bending. All bending radii are re-compacted to restore magnesium oxide density in bends. Tubular element is copper brazed to the stainless steel mounting plate providing excellent heat transfer from the element through the plate to the wall of the crucible. Plates can be pre-drilled to specification for a simple and efficient mounting method. Conservative sheath watt densities are designed for a long heater life. Various terminal configurations are available including threaded studs, plate terminals or lead wire with and without stainless steel metal protection braid. Plate type heater can provide longer life than the various strip heaters that are available. Flexibility of size and wattage reduces the number of strip heaters required; requiring fewer high temperature connection points. Tubular heater can be supplied with long cold sections, allows electrical field termination outside heated zone. AccuTherm nozzle heaters are designed to fit the nozzle on a zinc high pressure die casting machine. Standard voltage ratings ranging from 120V to 277V. Wattage ratings to 600 Watts. Precision wound nickel/chromium resistance wire is type “A” 80% nickel and 20% chromium. Suitable for operating temperatures of 2150 oF. Designed for maximum wire size, helical coil pitch and centering in magnesium oxide matrix. Resistance wire fusion welded to alloy terminal pins providing 360 degree circumferential weld bead. Highest grade magnesium oxide with optimum compaction providing maximum electrical resistant properties coupled with excellent heat transfer characteristics. Above parts are encased in an Incoloy 840 tube. Tube is roll reduced to its finished size and annealed for bending. Terminal ends of the element are over-sleeved to provide corrosion protection from the hot metal. Element is assembled into a machined steel cup with a diameter that is machined to close tolerances and sized to fit the nozzle barrel. Standard unit will fit a 1” diameter nozzle. Custom made units can be supplied for 0.750” minimum to 1.125” maximum nozzle diameter. Element is sealed into the cup using a 1250 oF heat transfer cement. Ends of cup are welded with end disks providing a compact rugged assembly. Wide variety of terminal leads. Standard leads are MG1000 nickel clad copper conductors. Over sleeves of conduit or braided sleeving are available. Units are designed and tested to meet CSA, UL, CE, and NEMA standards. Also available with internal Type K thermocouple. 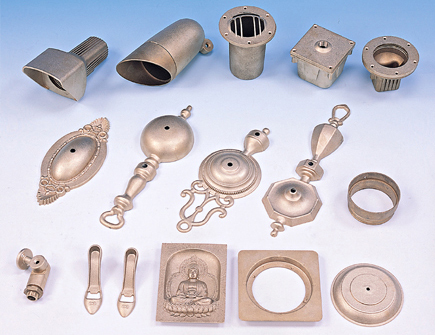 AccuTherm will provide a quality and efficient heater for your die casting industry. Please contact one of our professionals at www.accutherm.com.